In the not too distant future, Earth has been taken over by aliens (later identified as “Masters”) who travel about in large metal tripods. To control the populace, all humans are “capped” on their fourteenth birthday: their head is shaved and a metallic cap is applied to their head. The cap suppresses curiosity and creativity, leaving the recipients placid and docile. 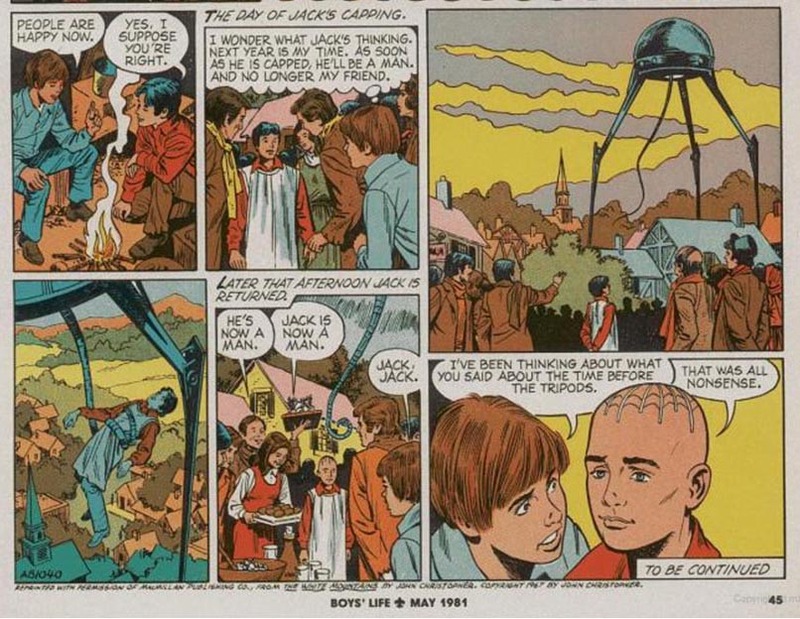 As The White Mountains opens, thirteen-year-old Will and his cousin Jack are discussing life before the Tripods came, before Jack’s upcoming capping. Will has his father’s watch, one of only five timepieces in their entire village. Jack then tells of a visit he made four years ago to stay with an aunt, and tells of a ruined city he saw by the edge of the sea, a city at least twenty times as big as their village of Winchester. I fell silent. I was trying to imagine it, to see it in my mind as he had seen it in reality. But my mind could not accept it. 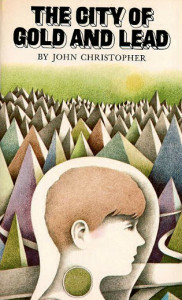 Shortly thereafter, Will meets a Vagrant who is entirely sane, and who tells him that there is a resistance movement of uncapped humans in the Alps (the White Mountains of the title). He escapes from his village (and his capping) with his cousin Henry and together they make their way to France, where they meet Jean-Paul, whom they nickname Beanpole. Beanpole knows that humans created much before the Tripods came, having constructed a crude pair of glasses himself. Following a map given them by the Vagrant, they head out for the Alps, avoiding and encountering Tripods along the way, hoping to join the resistance. The City of Gold and Lead: Will makes his way to a city of the Masters, where he is taken in as a slave by one of the Masters. Both the heat and gravity of the city have been increased to match the home planet of the Masters, and as a result, most slaves don’t live longer than a year. Will must rush to find the secret of destroying the Masters before he himself is destroyed. The only question is whether he will reach it before being killed, or worse, discovered and capped. The Pool of Fire: Will and a small group of free people launch a daring plan to destroy the Masters’ three great cities before they destroy humanity. I loved comics then even more than I do now, but looking at that panel now, I’m amazed that the comic strip held my attention, but it did. It was not the artistic quality of the comic I felt myself drawn toward, but the quality of the story. And what a story! There is always a danger, in coming back to a book you read and loved as a kid, that there is now too much time and space between you and the book to really enjoy it. I’ve read a few reviews of this series, such as this one, that accuse these books of being a bit juvenile. That’s no crime in my book; I can still read Winnie-the-Pooh when I’m in the right mood and enjoy it immensely. The key phrase is “in the right mood”. Sometimes I want to read something and have the same expectations I had of books I did when I was younger. Books are time machines that can take you backward as much as they can take you forward. I’m not going to claim that these books are great literature, or even that they’re great science fiction. In some ways, they’re not even science fiction—I’d have to agree with John Christopher when he says that they’re more of an adventure story. (You can read that interview in the bottom image of this article from Radio Times magazine.) I was on the edge of my seat when Will, Henry, and Beanpole fought with the Tripod, and I couldn’t go to bed after Will’s fight with his Master until I finished the entire book. Would I have felt this way if I were reading the book in an adult mindset? No. I had to go back to my twelve-year-old self. And that was a lot of fun for the weekend it took to read these three books. Despite John Christopher’s assertion that these are really just adventure stories, there is much more to them than that. It was the ruins of the great-city which lay ahead of us, a mile or two distant. I had never seen anything remotely like it before. It stretched for miles, rising in hills and valleys. The forest had invaded it—there was the tossing green of trees everywhere—but everywhere also were the gray and white and yellow bones of buildings. The trees followed lines among them, like veins in some monstrous creature. I remembered Jack and his story of the huge ship in the harbor of the great-city south of Winchester. It had not occurred to either of us that he might have done more than gaze from a distance; no one ever approached the great-cities. But that was the way of thinking that came from Tripods, and the Caps. Beanpole’s suggestion was frightening, and then exciting. The nature of the veins became clear as we approached. The trees followed the old streets, sprouting out of the black stone of which they had been built, and thrusting their tops up above the canyons formed by the buildings on either side. We walked in their dark cool shade, at first in silence. I did not know about the others, but I needed all the courage I could summon up. Birds sang above our heads, emphasizing the quietness and gloom of the depths through which we made our way. Only gradually did we start taking an interest in our surroundings, and talking—at the beginning in whispers and then more naturally. “Pushed by one of your big kettles, maybe!” Henry said. Some of the buildings had fallen down, from age and weathering, and in places many—whole rows sometimes—had been flattened, crushed, it seemed, by a hammer from the sky. But a great number were more or less intact, and eventually we ventured inside one. It had been a shop, plainly, but of enormous size. There were metal cans everywhere, some still piled on shelves, but most of them scattered on the floor. I picked one up. It had paper around it, with a faded picture of plums. Other cans had pictures, too—fruit, vegetables, bowls of soup. They had held food. It was reasonable enough: with so many people living together, and no land to till, food would have to be brought to them in containers, just as my mother bottled things in summer for winter use. The cans had rusted, in some places right through, showing a dried-up indistinguishable mess inside. There were thousands of shops, and we looked in many of them. Their contents amazed us. Great bolts of mildewed cloth, still showing weird colors and patterns…row on row of crumbling cardboard boxes, full of rotting leather shoes…musical instruments, a few familiar but most incredibly weird…figures of women, made from a strange hard substance, clothed in the tattered remnants of dresses…And a place full of bottles, which Beanpole told us was wine. He broke the top off one, and we tasted it but pulled faces at the sourness; it had gone bad long ago. We picked up some things and took them with us: a knife, a small ax with an edge that was rusted but could be sharpened; a kind of flask made of a translucent blue material, very light in weight, which would carry water better than the flasks Henry and I had got from Captain Curtis; candles—things like that. But the shop that filled me with awe was quite small. It was tucked away between two much bigger ones, and as well as the usual broken glass it had a barrier of warped and rusted metal in front of it. When I looked in, it was like Aladdin’s cave. There were gold rings, set with diamonds and other stones, brooches, necklaces, bangles. And perhaps a score of Watches! First, note the quality of the writing. Christopher effortlessly describes this scene is a way that allows us to create a clear image in our minds. Part of it is knowing which concrete details to include—the black stone, the birds singing overhead, the rotting leather shoes—and which details to exclude. Although there’s no mention of the Eiffel Tower or Notre Dame, it’s the ruins of Paris, a city I know and love, that I see when I read this. The level of detail is such that readers can picture any city they’re familiar with. There’s enough detail to let us know we’re in a city; there’s not so much detail that the author’s mental picture intrudes on our own.1 I see Paris, you may see Cannes or Dijon or Chicago, or even the county seat if you’ve never experienced a truly large city. Christopher respects and trusts his readers enough to let them see the city they need to see: a city that’s familiar enough that they have a way to connect with this scene. Then, too, Christopher is a fan of the “he said, she said” school of dialogue attribution. People in his books don’t exclaim, or sputter, or growl, they say. The dialogue attribution is functional, telling only who said what. It is the story itself that tells us how they said it. Yes, there is the occasional asked in there, but asked is largely interchangeable with said, as far as questions are concerned. There’s also a single murmured, but it is the exception which proves the rule, largely because it is neither arbitrary nor gratuitous: it emphasizes the silence that Will, Henry, and Beanpole were standing in as they looked out over the city, and it contrasts with Beanpole’s usually energetic personality: Beanpole murmurs because he is in awe. But let’s plunge a little deeper here. This is the first time that Will, Henry, and Beanpole have encountered such a large artifact of humanity’s past. 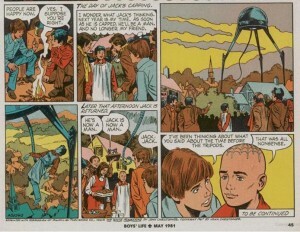 This is not just another scene (although the plot is somewhat episodic—one reason, perhaps, that Boy’s Life chose to serialize it as a comic); it is a major turning point in the story. Surely there must be something else going on here. Without the unifying metaphor of a specific city, Christopher provides another: the city as a body. He mentions “the gray and white and yellow bones of buildings” and lines of trees “like veins in some monstrous creature” (84). This presages the boys’ discovery of skeletons in the wreck of a car, but the damage done to the city reflects the control over individual human minds and bodies. The idea that they might enter the city, rather than skirt around it, is alien to Will and Henry; only Beanpole does not think this way. Most importantly, we return to the motif of the Watch. Watches have a curious attraction for Will; he steals and loses his father’s watch, and here he helps himself to another, nonfunctioning, watch. Watches allow us to control our use of time down to the minute; it is no accident that even the most primitive mobile phones automatically display the time. As we later discover, the Masters have their own way of dividing up the day, but this is not a privilege they extend to humans, whose sense of time has been reduced to the seasonal: planting, harvesting, Capping. It saddens me that these books aren’t better known. Few of my friends have heard of them, and those that have haven’t actually read them. Simon and Schuster recently re-released them, and they appeared in my local Barnes and Noble for perhaps a week before disappearing altogether. Yet at one point, these books were so popular that the BBC turned them into a television series, although they lost interest after The Pool of Fire. These books are hardly timeless, having been written in an age when sexism and racism in children’s literature were de rigeur. (See this article by Torie Bosch and this article by Jo Walton, for example.) But they succeed in a way that today’s young adult literature, such as The Hunger Games or Harry Potter do not: As Noah Berlatsky points out, Will is the protagonist of this story, but he is hardly a hero. Perhaps that explains why these books have dropped off the radar: we like books in which we can picture ourselves as the hero. Making Will anything but a hero adds a touch of verisimilitude that some (or even most) readers find uncomfortable in a book with so many fantastic elements. But as pure adventure, they work. A long weekend spent with these books is a good weekend indeed. Christopher, John. The City of Gold and Lead. New York: Collier, 1968. print. —. The Pool of Fire. New York: Collier, 1968. print. —. The White Mountains. New York: Collier, 1967. print. 1To paraphrase Stephen King, good description begins in the author’s mind and finishes in the reader’s. This passage is a perfect example of that. 2In fact, I would be happy if they wrote a tenth as well as this. It is no curious accident that much of their fame (along with their financial success) depends on film adaptations of their works, where the question of how much detail to provide is moot. Viewers see what the movie shows them, and little, if anything, is left to the imagination. (Thus, these movies are perfect for those who don’t want to think for a while.) Most fans of Twilight or The DaVinci Code are fans of the movies, not of the books, and fewer than half of those who own the books have actually read them, in my experience. 3This is true even in film. George Lucas makes effective use of place in Star Wars and The Empire Strikes Back (and less effectively so in the other films, when he becomes enamored of Ewoks and other potential toys). Without the electrical-fire stench of despair that is northern England during the Thatcher years (a truly desperate time and place), films like Billy Elliott and The Full Monty are reduced to mere character studies. The classic film Kes, which predates the Thatcher era by a decade, and which contains nary a blue sky effectively turns place (again, northern England) into a character itself. 4Beanpole is a singularly interesting character in these books. He is largely absent in The City of Gold and Lead, and although his role is pivotal in The White Mountains and especially in The Pool of Fire, Christopher keeps the focus firmly on Will. It’s almost as if he didn’t know what to do with Beanpole. But if we accept Christopher’s premise that these are adventure stories, rather than science fiction, it makes sense: Will is the doer, Beanpole the thinker. 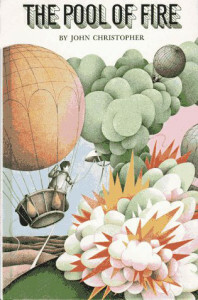 Will is the hero of this story, whose subject is reconquering the Earth. Beanpole is the hero of the story that comes after: recreating the lost world, an idea Christopher hints at near the end of The Pool of Fire. Great article. My sixth grade teacher read The White Mountains to the class & it is one of the major factors that inspired me to become a writer. I am a huge admirer of the Tripods trilogy. I’m glad you liked them. Christopher really is an under-rated writer. Have you read any of his other works? 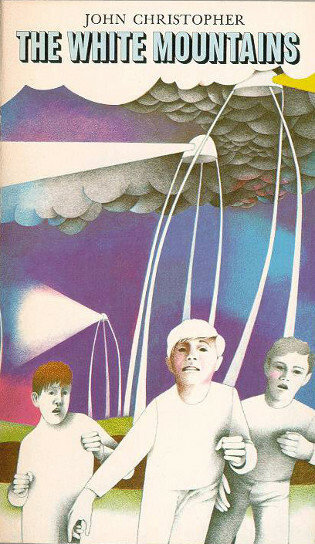 Yes, I have read The Death of Grass, A Wrinkle in the Skin, The Long Winter, When The Tripods Came. I quite enjoy his writing. Hi Farjam. You’re very welcome. Unfortunately, I haven’t read many of his other books. I’ve read The Lotus Caves, which takes place on the moon, and I’ve also dipped into The Sword of the Spirits trilogy, which is set far in the future (it’s kind of post-apocalyptic). I don’t know if you can get Wikipedia in English in Iran, but it has a complete list of his novels and short stories. If you can’t access that page, I’ve attached a pdf of it here. Let me know if there are any other ways I can help you. wow thank you very much bro, i appreciate for making the pdf for me.